The battle lines are drawn between the broadcasting and mobile radio industries over the future of the precious UHF spectrum. The economic case for the spectrum going to mobile has looked overwhelming and the need well justified by the huge growth in wireless data traffic being predicted by Cisco. But the UK broadcasters have come back with a very credible study showing that the UK will get far more economic value from Digital Terrestrial TV (DTT) continuing to use their current UHF spectrum. It is tempting to brush this study to one side in the face of the growing international bandwagon to give substantial UHF spectrum to mobile radio. But there are clear dangers in overlooking important issues that may well come back and cause an upset later. One of those issues is the long term future of free-to-air public service TV broadcasting in a wireless broadband Internet age. The future of free-to-air public service broadcasting is a political question with economic implications (or the other way around). The politics of scheduled TV broadcasting is that it aggregates a large national audience that translates into a powerful channel of communication for the national political and cultural discourse. U-Tube may aggregate large audiences around particular video clips but it doesn’t translate into a channel of communication that replicates the current contribution made by public service broadcasting. It would be very surprising if any government said that free-to-air public service TV broadcasting had no long term future. But that needs to be tested. The continuation of free-to-air public service broadcasting is not the same thing as the continuation of the current DTT platform. No technology platform lasts for ever…so at some point in the future consideration would naturally be given to replacing the DTT platform by something more efficient. Looking beyond DTT is helpful in lifting the debate forward of the current commercial concerns of the broadcasting interests. It also does not automatically follow that what sits beyond DTT is the current 4G wireless broadband networks. The free-to-air TV channels over DTT (and the hours they are watched) are not a trivial amount of data that can be easily absorbed onto the UK’s 4G mobile networks, let alone duplicated across all of them. 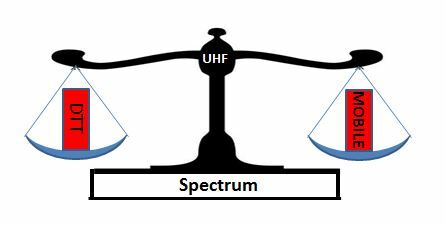 Even with the boost of additional UHF spectrum the networks would be flattened with their current architecture. The current competition model is problematic and the current mobile business model does not work for the carriage of the UK free-to-air public service TV channels. An approach that looks beyond the current DTT platform and the current 4G mobile broadband networks creates a white sheet of paper on which the future of the UHF spectrum and future wireless broadband infrastructure can be considered calmly. The key question is whether the UK should be steering towards a future national wireless broadband Internet that is capable of carrying everything or whether the service extremes (very high bandwidth requirements like TV or very low date rate requirements like M2M) are best handled by separate specialist networks? It is a question that must be addressed in considering the research requirements for 5G and the related international standards. So it is very timely to pose the question. One wireless broadband network capable of handling all services looks to be the most desirable goal. It resolves where the UHF spectrum should go, is more easily aligned with global terminal supply and one network looks more efficient than two…but the success or failure of this approach lays in getting the right conditions in place. Those conditions include how the spectrum is used (can’t be sensible for every competing network to replicate the same free-to-air TV channels but avoiding this will require a degree of open access), a serious mobile network evolution is required (efficient multicasting and a network topology that can efficiently replicate DTT coverage/capacity at the mobile cell edges) and the right regulatory framework (who pays for the data transport). The engineer in me suggests that consideration may need to be given to the future “even higher definition” TV being displaced onto satellite, cable and the fixed broadband Internet. (i) Is there is to be a central role in our national life in the long term future for public service TV broadcasting or is Twitter the medium of the future for our political and cultural discourse? (ii) Is there a need to distribute those public service TV broadcasting channels by a terrestrial wireless means after DTT or can a mix of broadcasting satellites (eg the BSkyB platform) and the fixed broadband network do the entire job? (iii) Can a future mobile broadband network (evolved 4G or 5G) distribute public service TV broadcasting considerably more efficiently than DTT, if not should an obsolete DTT (on the time-frame we are considering) be kept running. The first two questions are a matter for the government and the third (the efficiency evaluation) a matter for the research community. We are fortunate that the Surrey University 5G IC is particularly well positioned to address the technical aspects of this third question as it has both the BBC and leading mobile companies as members. (Acknowledgement: My thanks to Anirban Roy (Arqiva) and Steve Hearnden (TechUK) whose contributions at the recent UK Spectrum Policy Forum meeting inspired me to attempt this challenging blog. Anirban presented a very powerful case for the value that DTT is providing in the UK today and Steve made the insightful comment in the discussion that followed that the key to the mobile versus DTT claims for the UHF spectrum is to explore what might replace DTT in the long term future). You are currently reading "Future of free-to-air public service TV broadcasting in a wireless broadband Internet age"